BBC Arabic, the new Arabic Speaking London based News TV station has officially started its broadcast this week, joining a competitive and congested market of Arabic Speaking international News channel worldwide. BBC defines its Arabic service as a fresh and objective approach to the region, in a dynamic and modern cross-multimedia platform consisting of TV, Radio, and Online Arabic speaking services. 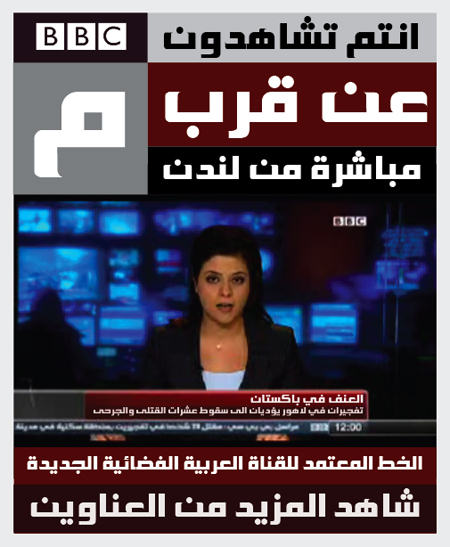 Preview of the new custom Arabic font developed by Tarek Atrissi Design for the new BBC arabic speakingsatellitetelevision. The launch of the Television channel marks the end of a long term project we have been involved in at Tarek Atrissi Design– consisting of the design and implementation of a custom Arabic Typeface- for on screen and off air usage. 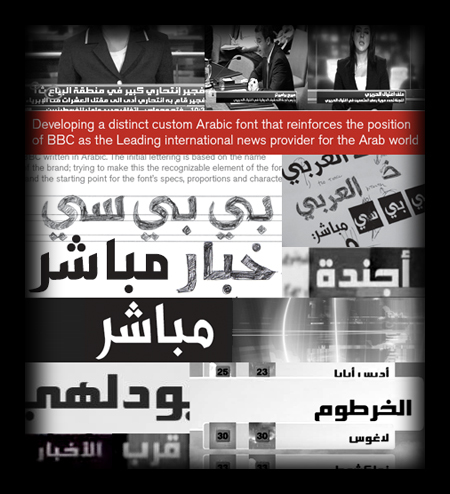 The Arabic Typeface design project, which started at the end of 2006, became an key aspect of the channel’s branding, particularly with the managerial decision not to develop a specific Arabic Logo for the channel- and sticking hence with the overall BBC TV Branding and look and feel. The Developed Arabic font became then one of the main key identifying element of the channel, and the constantly present main element of the on Air Branding. The process of defining the mission, vision, and overall appearance and communication elements of BBC Arabic were something we had to be naturally involved in, in order to succeed with our Custom Type Design branding assignment and help define further the visual identity of the channel. Our research started with a look at the first BBC Arabic satellite attempt, launched back then in 1994 as the first satellite Arabic Channel in the world- which led us to find some of the old simple (yet charming) screen graphics (and typography) of the BBC Arabic of the mid 90s. The Channel back then lived only for two years, when editorial content debates led to the end of a tensed relation of the Saudi Arabia financing partners of the channel. Many argue that the collapse of BBC Arabic back then is one of the main reasons that resulted in the current success and dominance of Al Jazeera, that launched the same year of BBC arabic going off air, and was staffed by many of the BBC’s previous employees that somehow carried the same spirit and approach into Al Jazeera. Screenshots from the initially launched BBC arabic of the mid 90s, with interesting previews of typographic and calligraphic elements used at the time. Take two of BBC Arabic, coming nearly 12 years after its shutdown, came with a more secure financial future (as it is funded by the British government), yet with very high expectations within the fierce present competition, within a market with 500 Arabic language channels. This explain maybe why the BBC- as a client- has been so involved in every step in the design process, and had to think and re-think every step of the research and execution- more than any other other type design client that I dealt with before. The set goal of BBC to reach an audience of 25 million viewer across the Arab world did not make things easier for us. Questions on how to appeal to such a vast group- with vast typographic preferences- and how to convey in a font both a traditional and modern voice, reflecting both the tradition and values of BBC as well as the modern Arabic spirit it aims to project. All that while keeping a recognizable look for the font that will be identified by the viewer as the specific BBC screen headlines font. The early phases of the project were very similar to the first steps of a visual identity development process. Starting by defining the target group and analyzing the audience’s aesthetic preferences and the typographic trends they tend to appreciate. The positioning of the font resulted from a detailed study of positioning of other existing used fonts today across Arabia, that clearly narrowed down for us some of the stylistic characteristic we will follow, and some of the main design characteristics that we will have to avoid. Selected sketches and lettering explorations from the long process of design, production and testing of the BBC Arabic Typeface. The end result of the BBC Arabic font is a kufi inspired bold font with a characteristic thin horizontal baseline that contrasts with the vertical and other horizontal strokes. The font was adapted to be used for both the main headlines and for the rather smaller continuously running news flash at the lower of the screen. So many different directions were explored, and so much corporate politics were bypassed, and very opposite & different opinions during the process between Arab speaking and non Arabic speaking management at BBC left us puzzled, but leading eventually to the final Arabic font on air as of last week- making us very excited at Tarek Atrissi Design that we were part of this remarkable point in the ever developing Arab Media.